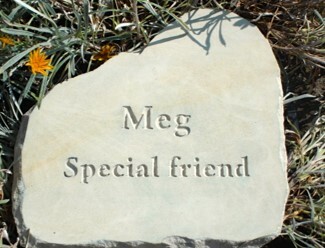 Skip's pet memorial "...really something special, extremely well produced and a credit to his memory "
A beautiful stone cat memorial for Dusty from Running Free pet memorials. Made from sandstone and inscribed with a Roman font, this stone cat memorial will keep Dusty’s memory alive. This post is to introduce ourselves and to say why we started Running Free and what we are all about. The picture below is of Minnie (my friend’s cocker spaniel) snoozing on the beach at Hengistbury Head in Dorset, and it is included here simply because it’s my favourite dog picture from last year.